At Adventure Central, today’s seedlings are becoming tomorrow’s forests — and Douglas May is a prime example. Not only is he literally helping grow forests, he has grown from a reserved 9-year-old to an exemplary volunteer with a passion for reforestation. May’s attitude and dedication earned him the Adventure Central Volunteer of the Year award in 2015. Adventure Central offered May the opportunity to embrace the program’s emphasis on nature, unstructured outside play and service. After progressing through each age group and attending the after-school program and summer day camp, May dedicated himself to the concept of service, an integral part of the Adventure Central program. He follows the example of his mother, Marqueitta Captain, a strong supporter of Adventure Central and a Five Rivers MetroParks volunteer since 2007. Adventure Central — a youth development partnership between Five Rivers MetroParks, 4-H, The Ohio State University Extension and the University of Dayton — was a springboard for May. In addition to volunteering, he also applied to be part of the Job Experience and Training Program (JET) for teens ages 12-18. For the past three years, May has helped with gardening and conservation projects, including taking on the daily care of the vegetable and herb garden beds and assisting with animal care. Most recently, May embraced his largest and possibly most challenging volunteer opportunity yet, an ambitious conservation project in which native tree seeds and nuts were harvested and grown into saplings in the Adventure Central basement at Wesleyan MetroPark. After participating in MetroParks’ “Go Nuts!” campaign, when more than 90,000 acorns and hickory nuts were collected, May and his peers were inspired to tackle this reforestation project. They collected a variety of nuts — as well as native shrub, spice bush and paw paw seeds — for germination and transplantation. By the end of 2016, the project will have yielded an estimated 3,000 saplings. “Doug can be counted on to come in and independently complete tasks on daily basis. He’s willing to try new things,” said Nate Arnett, director of Adventure Central. 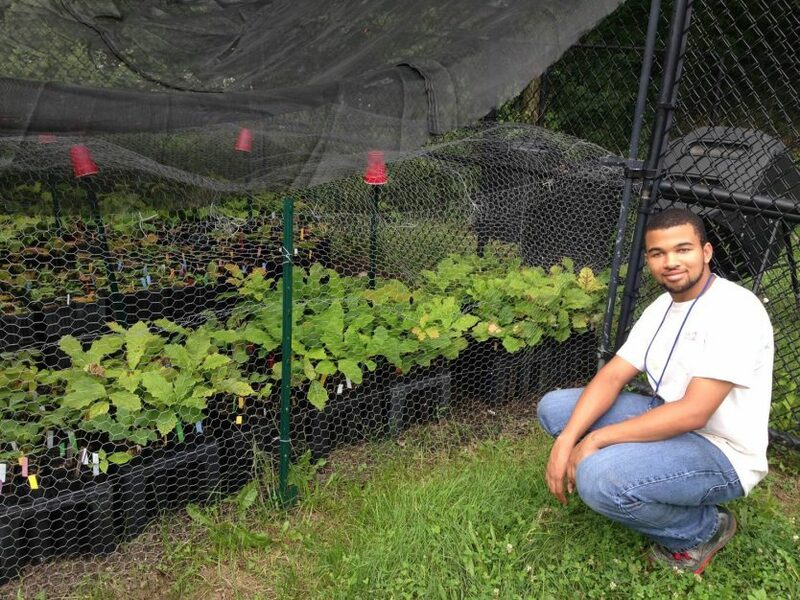 May spent the summer working with the Five Rivers MetroParks’ conservation team, looking after his saplings at the Great Miami Mitigation Bank and Wesleyan MetroPark.